The Potato grow bags are ideal for patios, small gardens, balconies, sun rooms, and any indoor and outdoor space. They can be used to plant potato, taro, radish, carrots, onions, and many other vegetables. 1: Built on carrying handles, you can easily move from different containers and set them outside when weather permits. 2: The Fabric bags combine the ease of use of a traditional nursery pot with the benefit of a breathable container. 3: Keep the roots of your favorite plants cooler with more room to grow by planting in a breathable Garden Fabric Pot. 4: Key Benefits of Garden grow Containers: Stronger, healthier plants from start to finish. Improved overall root structure, producing more root tips. Better use of water and nutrients. Quicker growing time with bigger yields. Growing bags are ideal for plants that don't have deep roots, such as tomatoes, cucumbers, sweet peppers, chilli peppers, aubergines and courgettes. Plant two to three plants in each bag during spring. Alternatively, cut a long panel in the top of the bag and sow salads in rows. Endive, lettuce, basil and rocket can be sown from spring to late summer. If growing salads, prepare the bag as before and cut out a long panel on top of the bag. 1. Please allow 0-3 cm error due to manual measurement. please make sure you do not mind before you bid. ★Durable: Comes with 2 handles for easy moving the planter tub, the seams are strong and well stitched with heavy thread, double-layered, environmentally friendly fabric to resists corrosion and durability. The PE material, handles, and other accessories are heavy duty and ready to get to work. It allows roots to breathe and grow healthier, boosts plant growth and yields They are non-toxic, biodegradable and reusable. ★Functional: These garden planter bags are suitable for indoor and outdoor planting. They are ideal for patios, small gardens, balconies, sun rooms, and any outdoor space. They can be used to plant potato, taro, radish, carrot, onion, cucumber, aubergine, pepper, courgette, and many other vegetables and harvest your vegetables easier. ★Advantage Design: Drainage holes on bottom of the planter allow excess water to escape, Strong hand-stiched seams and rip-resistant carry handles allow for easy movement. Feature checking panel where you can get the potatoes out from the bottom without disturbing the plants up top, easy to remove the weeds & excess soil before they are big enough to dig. ★The Access Flap: The access flap eliminates the need to remove the plant & soil and allows easily access to your homegrown produce. 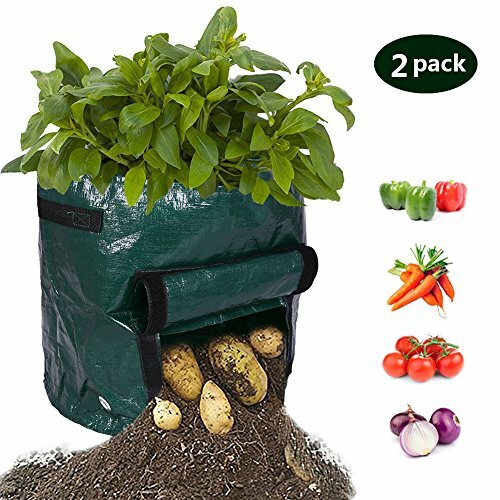 Make you get potatoes without damage plant, Lightweight waterproof easy to hanging with handles, can use it anywhere stairs, balcony, roof, corner, or on your wall. Convenient handles for easy moving. ★Breathable Root Holes Feature: The garden planter bags made of PE material which is eco-friendly and reusable in used, built in 2 side holes allow roots to breathe and grow healthierand 3 from the bottom for adequate drainage, unique desige for our planter. You can observe the growth status of the root at any time, which is suitable all fruits and vegetables with roots for indoor and outdoor planting. If you have any questions about this product by Albabara, contact us by completing and submitting the form below. If you are looking for a specif part number, please include it with your message.